Discussion in 'Lexus Lounge' started by krew, May 13, 2015. 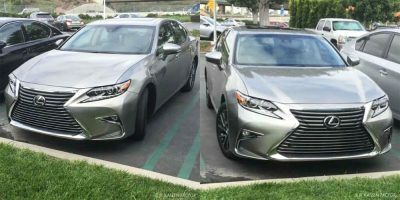 A 2016 Lexus ES in Atomic Silver has been spotted in Southern California, making it the first time the updated sedan has been seen on public roads. I hated how it looked at the reveal.. But I love how it looks here! mikeavelli and OlFius like this. DDas and mikeavelli like this. And I really like how in the Middle-East specially in the UAE, its still a big hit for the ES. Cause its used for VIP taxies around the county! Hmm, to be honest, I liked it better at the reveal. Perhaps it's the angle and lighting, but the grill has too many visible horizontal lines reminiscent of an air conditioner grille. I'll reserve final judgment with better pics or seeing it in person. I was in the UAE, about 6 months ago, and I could not spot any NX. Is the NX not immediately successful there ? Hamed Al Ketbi and mikeavelli like this. No question . . . the right color makes a huge difference! Very nice update. Honestly, I still like the current front end, so to me this is more "different" than "better." mikeavelli and RAL like this. AGREED! I hate that the Camry has a "spindle" grille. We saw that Lexus wants to distance themselves from Toyota (which they have been doing very well lately), and then Toyota slaps a spindle grille on the Camry and said they wanted the rear to be more "ES like." It bothers me that the Avalon and Corolla have such a beautiful design that the Camry could have adopted but no, Toyota felt the need to copy Lexus with its grille. The next Camry better look nothing like a Lexus because it's giving people an excuse to say "rebadged Camry/Toyota." Anyways, these live wild shots look really fantastic! The silver is so much better than that horrible brown they revealed it in. GuoxJason, CIF, mikeavelli and 2 others like this. Now that's a creative observation! Excellent point, DDas. Looks like the Goose and the Gander are both trying to lay the same egg. Silver, though, tends to be a me-too color, without any real distinction nowadays....it is just so common. Even if one thinks the brown is ugly or not his or her cup of tea (and I respect people's objective opinions on that)....at least it is different, and not all over the place like silver. CIF, RAL and mikeavelli like this. I agree. Silver is just too common and boring, and being that I'm basically nearing my midlife crisis, the brighter the better! It may be just because I own a silver ES haha. I would have loved to see the new red that debuted on the RC on this ES. Now that would have been nice. Wow! As some here already know, I'm absolutely in love with Atomic Silver, so any Lexus I see with that color automatically looks amazing . I absolutely love how the ES looks with this color ! Wow! As some here already know, I'm absolutely in love with Atomic Silver, . I didn't know that, but I'm relatively new here, and still getting to know some of you. I wasn't knocking Atomic Silver, just pointing out that silver, in its various shades, is one of the most widespread colors in the industry. I myself am a fan of the Titanium Gray...a dark silver with a very powdery marked-metallic-effect. It's beautiful when done correctly. Atomic Silver is just a very unique take on silver. Usually I'm not a big fan of silver, but this, this is something else. Try and see a Lexus model with Atomic Silver in person, it will be worth it . mmcartalk and RAL like this. Atomic Silver cannot be captured truly in photos. You have to literally see it to appreciate how different it is from anything out there that is silver. We traded our Silver Lining Metallic RX in on an Atomic Silver NX. The two colors are totally different! And the amazing thing is how different the color looks in different lighting. I'm with you CIF. It is absolutely my favorite color too. This color could make a Yugo look good . . . well, maybe not. mikeavelli, mmcartalk and CIF like this. Extremely well said RAL . Pardon You? You're a moderator...you can comment as much as you want. Besides, I sometimes post several times in one thread myself. I'm with you CIF. It is absolutely my favorite color too. Well, I guess I'm going to have to take you guys up on that. We'll see if it looks as good as the Titanium Gray. This color could make a Yugo look good . . . well, maybe not. mikeavelli, CIF and RAL like this.